The Panasonic KV-SSM100 Network Scanner Solution | Industry Analysts, Inc.
Panasonic’s M100 series network scanning system features the advanced processing power of an Intel Core™ i5 tablet providing a fully-connected document management and imaging solution. 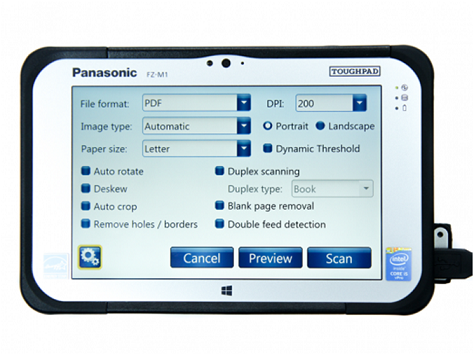 The KV-SSM100 Network Scanner Solution works with all Panasonic document scanners*, includes high-speed Ethernet and wireless network connectivity and eliminates the need for manual scanning and data entry with the ability to scan to shared folders, email or fax at the touch of a button. Enhanced features include duplex and batch scanning, ability to scan long-form documents, local user management and remote administration. Click here to see Key Features! This entry was posted in Panasonic and tagged KV-SSM100, Network Scanner, panasonic, scanner by IA Staff. Bookmark the permalink.